For the turbocharged four-cylinder 2.3-liter engine, the power pack dials output to 362 horsepower (270 kilowatts) and a healthy 398 pound-feet (540 Newton-meters) of torque, up by 50 hp (37 kW) and 80 lb-ft (108 Nm) compared to the standard AU-spec ‘Stang. The additional oomph was extracted by recalibrating the engine’s ECU, installing a custom cold air intake, and adding Tickford’s own quad catback exhaust. 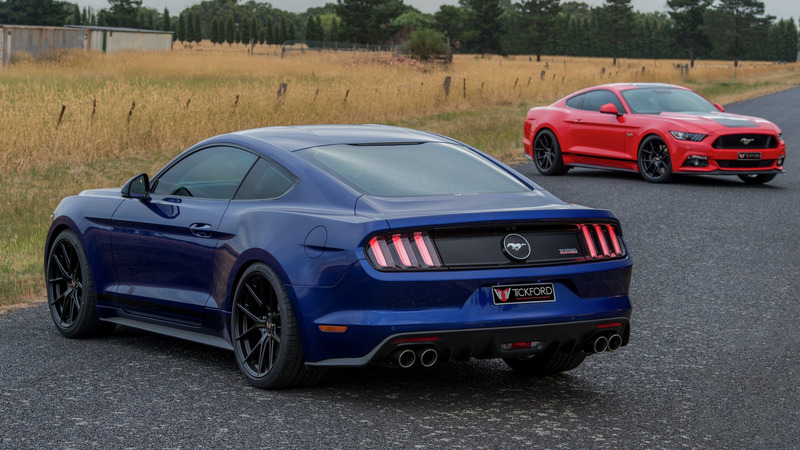 Just about the same upgrades have been implemented in the Mustang GT, which now delivers 483 hp (360 kW) and 431 lb-ft (585 Nm) from its naturally aspirated 5.0-liter V8 engine. Compared to a stock GT, the bump in output stands at 72 hp (54 kW) and 40 lb-ft (55 Nm). 483hp from a naturally aspirated 5.0 V8 is impressive specially in a RHD export model which normally has less horsepower than the US version (because of a redesigned exhaust manifold with more bends to clear the RHD steering shaft). 2b2, ZanatWork, jpd80 and 2 others like this. Last edited by AM222; 01-30-2017 at 12:59 PM. badhac and ScarredKnightfan like this. Actually there are gobs of aftermarket kits for EB stang. If only they could make a good sounding exhaust for the Ecoboost, personally I havent found one I like. I think we all expect and endure loud exhaust to be associated with more performance. But that does not have to be the case for every performance option. I have heard exhaust kits for I4 EB Mustang that are modestly louder, but much deeper. I am OK with that. But I think you can get significant gains while maintaining quiet exhaust for those that don’t want an I4 sound. In fact, I would not mind only hearing the turbo itself. Call it a sleeper, if you will. Nice and quiet, but lots of quiet thrust when called upon.